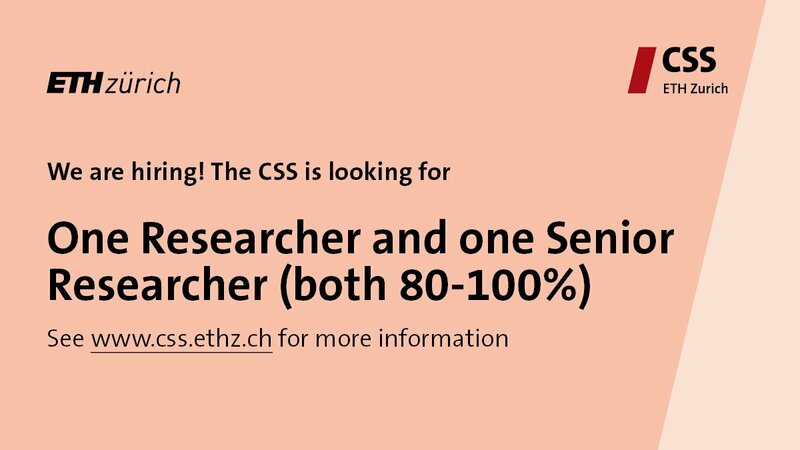 The Center for Security Studies (CSS) of ETH Zurich is a competence center for Swiss and international security policy. It offers security policy expertise in research, teaching, and consultancy. The Risk and Resilience Team within the Center's Think Tank is currently seeking one researcher and one senior researcher (both positions 80-100%). The ideal candidate has an advanced university degree (Masters or PhD for the Senior Researcher), preferably in the social sciences, but the candidate should be able to demonstrate a capacity to work collaboratively within and beyond the social sciences. For the senior position, several years of post-doctoral experience should complement your high-level analytical skills. Personnel management experience would be considered a strong advantage in the senior role. The CSS is a multi-lingual working environment, so proficiency in English alongside one other Swiss national language (German, French, Italian or Romansh) are required. Experience working with international organisations or think tanks would be an asset. Knowledge of the Swiss political landscape is an advantage. An independent and well-organized working style, as well as good communication skills and the ability to work in an international team will be essential for both positions. CSS is looking forward to receiving your online application with letter of motivation, CV and two written samples by 10 March 2019. Apply exclusively via the online application portal. Applications sent by e-mail or post will not be considered.